9-10 Apr 2019: The Future of Offshore Wind Energy conference of the Association of German Offshore Windfarm Operators (BWO), Berlin, Germany. 2-4 Apr 2019: WindEurope conference and exhibition, Bilbao, Spain. 20 Mar 2019: Business Funding Show Networking Reception, London, UK. 7 Mar 2019: Offshore Wind Contracts For Difference (CFDs), Glasgow, UK. 6 Mar 2019: Offshore Wind Scotland International Opportunities meeting with delegates from Europe and the USA, Glasgow, UK. 21 Feb 2019: Business Funding Show, London, UK. 1 Feb 2019: Wind Farm Analytics seminar on converging beam LIDAR at Coherent Scotland, Glasgow, UK. 30 Jan 2019: Rushlight Show, Royal Society, London, UK. 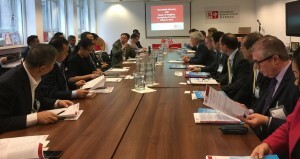 25 Jan 2019: China-Britain Business Council Offshore Wind meeting, Edinburgh, UK. 15 Jan 2019: Power Curve Working Group meeting, Seville, Spain. 14 Jan 2019: IEA32 Wind LIDAR workshop on Wind Field Reconstruction in the Induction Zone, Seville, Spain. 12 Jan 2019: An updated version of the paper “Error Propagation Analysis for a Static Convergent Beam Triple LIDAR” has been provided within the University of London Birkbeck Mathematical Sciences Preprint Series, London, UK. 14 Dec 2018: Clean Energy Private Equity & Venture Capital (CEPEC) conference, London, UK. 15 Nov 2018: Technology Scotland Annual Dinner with Ivan McKee MSP, Minister for Trade, Investment and Innovation and Author / Futurologist Mark Stevenson, Glasgow, UK. 1 Nov 2018: Wind Farm Analytics Ltd would like to thank delegates of the Yangjiang (Guangdong) offshore wind industry for visiting the UK and meeting at the China-Britain Business Council to discuss the possibility of cooperation between UK and China offshore wind businesses. 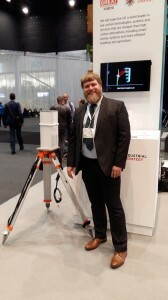 Wind Farm Analytics converging beam LIDAR technology will be beneficial for the entire global wind industry in support of the United Nations sustainable development goals, London, UK. 31 Oct 2018: Cleantech Venture Day, KPMG, London, UK. 30 Oct 2018: NOAH Investor Conference, Old Billingsgate, London, UK. 16 Oct 2018: Wind Farm Analytics Ltd is exhibiting the beam steering LIDAR at the Innovation Summit for Green Great Britain organised by the UK government Department for Business Energy & Industrial Strategy (BEIS), London, United Kingdom. 25 – 28 Sep 2018: WindEurope Hamburg, Germany. 24 Sep 2018: Wind Farm Analytics Ltd has fed back into the UK government Department for Business, Energy and Industrial Strategy (BEIS) consultation on Capacity Market and Emissions Performance Standard review, London, UK. 20 – 21 Sep 2018: IEA32 Wind LIDAR workshop on Turbulence and Loads, Gentofte, Copenhagen, Denmark. 31 Aug 2018: Wind Farm Analytics Ltd and Birkbeck College of University of London have provided a new working paper developing the “Error Propagation Analysis for a Static Convergent Beam Triple LIDAR”, London, UK. 28 Jun 2018: Scottish Trade Mission to Munich, Munich Chamber of Commerce, Munich, Germany. 27 Jun 2018: Scottish Trade Mission to Nuremberg, Nuremberg Chamber of Commerce, Nuremberg, Germany. 25 – 26 Jun 2018: Scottish Trade Mission to Berlin, UK Embassy and Berlin Chamber of Commerce, Berlin, Germany. 12 – 14 Jun 2018: Exhibiting beam steering LIDAR at the Great Britain and Northern Ireland Innovation Hub stand, International Business Festival, Liverpool, UK. 30 May 2018: UKIPO has published Wind Farm Analytics Ltd third granted patent GB2552619B (including floating converging beam LIDAR for the offshore wind industry) within the UK Patents Journal 6732, Newport, Wales, UK. 2 – 3 May 2018: AllEnergy conference and exhibition – Wind Farm Analytics Ltd will be at the InnovateUK stand C-20 on 2nd May 2018, Glasgow, UK. 1 May 2018: UKIPO has written to confirm that Wind Farm Analytics Ltd third patent GB2552619 (including floating converging beam LIDAR for the offshore wind industry) is to be granted, Newport, Wales, UK. 25 Apr 2018: UKIPO has published Wind Farm Analytics Ltd second granted patent GB2532585B (covering fluid measurement for non-wind turbines such as tidal turbines) within the UK Patents Journal 6727, Newport, Wales, UK. 25 Apr 2018: “Doing Business in Germany”, Glasgow Chamber of Commerce, Glasgow, UK. 24 Apr 2018: Technology Scotland “Attracting Inward Investment”, Edinburgh, UK. 23 Apr 2018: ETP Energy Innovation Emporium, Technology Innovation Centre, Glasgow, UK. 19 Apr 2018: Debate on “Scotland’s Energy Future”, Royal Society, Edinburgh, UK. 19 Apr 2018: “Engage Invest Exploit” Investor Conference, Edinburgh, UK. 18 Apr 2018: ETP Conference on Energy Storage for Scotland, University of Strathclyde, Glasgow, UK. 27 Mar 2018: UKIPO has written to confirm that Wind Farm Analytics Ltd second patent GB2532585 (covering fluid measurement for non-wind turbines such as tidal turbines) is to be granted, Newport, Wales, UK. 22 Mar 2018 (postponed from 1 Mar 2018 due to major transport disruption): Future Wind 2018 conference at the Technology Innovation Centre, University of Strathclyde, Glasgow, UK. 20 Mar 2018: In response to Wind Farm Analytics Ltd application for Enterprise Investment Scheme Advance Approval HMRC has written to confirm that they would be able to issue relevant compliance certificates for EIS, enabling tax benefits for certain investors subject to full application. Subject to HMRC rules EIS gives investors 4 advantages – 30% income tax relief; no capital gains tax on profits; any losses are offset against other capital gains; no inheritance tax. UK. 30 – 31 Jan 2018: IEA32 Wind LIDAR workshop on Certification of LIDAR-Assisted Control Applications, Hamburg, Germany. 29 Jan 2018: Wind Farm Analytics Ltd and Birkbeck College of University of London have provided a working paper on the mathematical analysis of convergent beam LIDAR wind velocity measurement uncertainty, London, UK. 25 Jan 2018: Rushlight Awards innovation and investment conference – Project AMFIBIAL on floating converging beam LIDAR wind measurement – a collaboration between Wind Farm Analytics Ltd, Thales UK Ltd and Fraunhofer UK Research Ltd – has won the Wind Power award as well as the Natural Energy award; posters were presented on project AMFIBIAL as well as project BIOFOWL blade integrated LIDAR (in collaboration with Fraunhofer UK Research Ltd and blade specialists Renewable Advice Ltd), London, UK. 8 – 9 Nov 2017: Wind Power Big Data and Machine Learning conference, Berlin, Germany. 1 – 2 Nov 2017: Scottish Business Exhibition, Glasgow, UK. 27 Sep 2017: IEA32 Wind LIDAR Workshop – Measuring Power Performance Using Nacelle LIDARs, Gentofte, Copenhagen, Denmark. 19 – 20 Jun 2017: IEA32 Wind LIDAR Workshop – Wakes and Complex Flow, University of Glasgow, Glasgow, UK. 6 – 8 Jun 2017: WindEurope/ Renewable UK Offshore conference and exhibition, London, UK. 31 May 2017: Wind Farm Analytics Ltd opposes fracking and has responded to the Scottish Government consultation on Fracking, Glasgow, UK. 29 May 2017: Wind Farm Analytics Ltd has responded to the Scottish Government consultation on Onshore Wind Policy, Glasgow, UK. 29 May 2017: Wind Farm Analytics Ltd has responded to the Scottish Government consultation on Energy Policy, Glasgow, UK. 29 May 2017: ETP Scotland Energy Emporium, Technology Innovation Centre, Glasgow, UK. 10 – 11 May 2017: AllEnergy conference and exhibition, Glasgow, UK. 9 May 2017: Wind Farm Analytics Ltd has prepared a worked example of how Energy Storage Use of System charging and Energy Storage Capacity Markets can work for the Scottish government consultation on Scottish Energy Policy, Glasgow, UK. 5 May 2017: Wind Farm Analytics Ltd has fed back suggestions to OFGEM on the “Targeted Charging Review: a consultation”. For context you can check the OFGEM TCR consultation document here. London, UK. 2 May 2017: Scottish Photonics – Global Economic Opportunity, Scottish Parliament, Edinburgh, UK. 2 May 2017: Scottish Government Energy Strategy Meeting, Glasgow, UK. 25 Apr 2017: NESCOE meeting and electricity industry dinner, Newcastle-upon-Tyne, UK. 21 – 22 Mar 2017: Scottish Renewables annual conference, Edinburgh, UK. 8 Mar 2017: Scottish Renewables Electricity Storage seminar on Feasibility and Site Selection, Glasgow, UK. 24 Jan 2017: Scottish Renewables Offshore Wind conference at the Technology Innovation Centre, Glasgow, UK. 23 Jan 2017: Norwegian offshore wind networking event, Glasgow, UK. 11 Jan 2017: Future Wind 2017 conference at the Technology Innovation Centre, University of Strathclyde, Glasgow, UK. 15 – 16 Dec 2016: Wind Farm Analytics Ltd has presented a poster on new LIDAR technology development at the general meeting of International Energy Agency task 32 “Wind LIDAR Systems for Wind Energy Deployment”, University of Strathclyde, UK. 14 Dec 2016: LIDAR Power Curve Measurements workshop, University of Strathclyde, UK. 13 Dec 2016: Power Curve Working Group meeting, Technology Innovation Centre, Glasgow, UK. 12 – 13 Oct 2016: Renewable UK conference and exhibition, Liverpool, UK. 26 – 30 Sep 2016: European Wind Energy Association conference and exhibition / Wind Europe Summit, Hamburg, Germany. 30 Jun 2016: Scottish Renewables conference on Energy Storage, Glasgow, UK. 29 Jun 2016: Scottish Renewables conference on Onshore Wind, Glasgow, UK. 8 Jun 2016: Wind Farm Analytics Ltd has responded to the Department of Energy and Climate Change (DECC) consultation on UK Contracts for Difference (CfD), including questions about energy storage. London, UK. 4 – 5 May 2016: AllEnergy conference and exhibition, Glasgow, UK. 26 Apr 2016: NESCOE meeting and electricity industry dinner, Newcastle-upon-Tyne, UK. 1 Apr 2016: Wind Farm Analytics Ltd has responded to the Department of Energy and Climate Change (DECC) consultation on the UK Capacity Market calling for measures to ensure the participation of pure renewable energy solutions such as tried and tested, long lifetime, cost effective, low carbon, zero pollution, job-creating, fast acting, flexible, controllable, efficient, medium and large scale wind-pumped hydro instead of new deployment of counter-productive fossil fuel plant, London, UK. 15 – 16 Mar 2016: Community And Renewable Energy Scheme (CARES) conference, Stirling, UK. 9 Mar 2016: Sensing Innovation Challenges in Offshore Renewables, Glasgow, UK. 23 – 24 Feb 2016: International Energy Agency (IEA) Workshop on Floating LIDAR, Offshore Renewable Energy Catapult (OREC), Blyth, Northumberland, UK. 26 Jan 2016: Scottish Renewables conference on Offshore Wind, Glasgow, UK. 20 Jan 2016: Scottish Renewables conference on Operational Wind Farms – Increasing Lifetime Revenue and Value, Glasgow, UK. 13 Jan 2016: Future Wind 2016 conference at the University of Strathclyde, Glasgow, UK. 18 Nov 2015: Wind Farm Analytics Ltd is glad to announce the publication of the granted patent GB2522581B including wind turbine LIDAR technology, The Patent Journal 6600, UKIPO, United Kingdom. 17 – 20 Nov 2015: European Wind Energy Association (EWEA2015) conference and exhibition, Paris, France. 14 – 16 Oct 2015: China Wind Power 2015 conference and exhibition, Beijing, China. 6 – 8 Oct 2015: Renewable UK conference and exhibition, Liverpool, UK. 15 – 18 Sep 2015: Husum 2015 wind energy conference and exhibition, Husum, Germany. 10 -13 Sep 2015: MeLa 2015 agricultural exhibition (Landwirtschaftsausstellung Mecklenburg-Vorpommern), Muehlengeez, Mecklenburg Vorpommern, Germany. 17 Jul 2015: Wind Farm Analytics Ltd has responded to the UK Department of Energy and Climate Change in relation to the proposed changes to the UK Renewable Obligation Certificate system, Glasgow, UK. 13 Jul 2015: Conference on “Renewables at Scale – Realising Gigawatt Generation” at the Institute of Physics, London, UK. 9 Jul 2015: Onshore Wind Summit held in conjunction with Scottish Renewables and Fergus Ewing MSP, Scottish Minister for Energy, Business and Tourism. Glasgow, UK. 3 Jun 2015: Please see the video of new LIDAR designs which Wind Farm Analytics Ltd has been working on. This can have many advantages for the wind industry. 6 – 7 May 2015: AllEnergy conference and exhibition, Glasgow, UK. 21 Apr 2015: NESCOE meeting and electricity industry dinner, Newcastle-upon-Tyne, UK. 4 Mar 2015: Wind Farm Analytics Ltd has been selected as a Finalist for Cleantech Innovate Scotland 2015. Glasgow, UK. 8 Jan 2015: Wind Farm Analytics Ltd international patent application has been published according to the Patent Cooperation Treaty with reference to International Filing Date 9 Jun 2014 and UK Priority Date 30 Jun 2013. 27 – 28 Jan 2015: Scottish Renewables Offshore Wind & Supply Chain conference, Aberdeen, UK. 14 Jan 2015: Wind Farm Analytics Ltd attended the Future Wind 2015 conference at the University of Strathclyde, Glasgow, UK. 16 Dec 2014: Holyrood, the Scottish government magazine, has accepted an article from Wind Farm Analytics Ltd on the subject of wind energy storage policy and suggesting that future capacity market auctions should require combined renewable energy generators with electrically co-located energy storage instead of fossil fuel grid backup! 11 Dec 2014: Scottish Parliament Cross Party Group on Renewable Energy and Energy Efficiency (SPREEE), Scottish Parliament, Edinburgh, UK. 26 – 27 Nov 2014: Community Energy Scotland annual conference, Edinburgh, UK. 19 Nov 2014: Wind Farm Analytics Ltd attended AgriScot, the Scottish farm business event, Edinburgh, UK. 21 Oct 2014: Wind Farm Analytics Ltd attended the ICARB Energy Storage workshop at Edinburgh Centre for Carbon Innovation (ECCI), Edinburgh, UK. 23 – 26 Sep 2014: Wind Energy 2014 conference and exhibition, Hamburg, Germany. 21 Aug 2014: ecoConnect debate on “Scottish Onshore Wind”, Edinburgh, UK. 16 Jul 2014: Scottish Renewables Seminar on “Contract for Difference (CfD) Delivery for renewable generators in the UK electricity market”, Glasgow, UK. 1 Jul 2014: Scottish Renewables Seminar on “Contract for Difference (CfD) Eligibility for renewable generators in the UK electricity market”, Glasgow, UK. 18 – 20 Jun 2014 The Science of Making Torque from Wind, Copenhagen, Denmark. 11 – 12 Jun 2014 RenewableUK Global Offshore Wind conference and exhibition, Glasgow, UK. 10 Jun 2014 SgurrEnergy Offshore Wind Seminar – “The Vital Role of Wind Measurements in Securing Long Term Viability for the Offshore Wind Sector”, Glasgow, UK. 21 – 22 May 2014: AllEnergy conference and exhibition, Aberdeen, UK. 7 May 2014: Moray Offshore wind energy meeting, Inverness, UK. 29 Apr 2014: NESCOE meeting and electricity industry dinner, Newcastle-upon-Tyne, UK. 19 Mar 2014: ecoConnect debate on Scottish independence and UK energy markets, Edinburgh, UK. 18 – 19 Mar 2014: Scottish Renewables conference, Edinburgh, UK. 10 – 13 Mar 2014: European Wind Energy Association conference, Barcelona, Spain. 28 – 29 Jan 2014: Scottish Renewables Offshore Supply Chain conference, Aberdeen, UK. 15 Jan 2014: FutureWind 2014 conference at University of Strathclyde, Glasgow, UK. 8 Jan 2014: ecoConnect conference on “Electricity Market Reform”, Edinburgh, UK. 5 – 7 Nov 2013: RenewableUK conference, Birmingham, UK. 28 Aug 2013: Seminar on “Energy Storage”, University of Strathclyde, Glasgow, UK. 22 – 23 May 2013: All-Energy conference, Aberdeen, UK. 8 – 10 Apr 2013: Hannover Messe, Hannover, Germany. 18 – 19 Mar 2013: Scottish Renewables conference in Edinburgh, UK. 4 – 7 Feb 2013: European Wind Energy Association conference in Vienna, Austria. 29 – 30 Jan 2013: Wind Farm Analytics Ltd attended the Offshore Wind and Supply Chain conference in Aberdeen, UK. 16 Jan 2013: Wind Farm Analytics Ltd attended the Future Wind conference at the University of Strathclyde, Glasgow, UK. 15 Jan 2013: Wind Farm Analytics Ltd attended the Scottish Renewables reception hosted by Rhoda Grant MSP, Shadow Minister for Energy, Enterprise and Tourism at the Scottish Parliament in Edinburgh, UK. 13 Dec 2012: Wind Farm Analytics Ltd attended conference on Smart Grids: Enabling The Low Carbon Economy in Glasgow, UK. 3 Dec 2012: The Scottish government magazine Holyrood has published an article by Wind Farm Analytics on energy storage co-located with wind farms. 30 – 31 Oct 2012: Wind Farm Analytics Ltd attended the RenewableUK conference in Glasgow, UK. 10 Oct 2012: Wind Farm Analytics Ltd attended an Institute of Physics seminar on Lasers and Photonics including discussion of wind industry LIDAR, University of Glasgow, UK. 18 – 21 Sep 2012: Wind Farm Analytics Ltd attended the Husum Wind Power conference in Husum, Germany. 23 – 24 May 2012: Wind Farm Analytics Ltd attended the AllEnergy 2012 conference in Aberdeen, UK.